Get Found -- Look Pro -- Earn More! Need better clients? You need a standout writer website. Here’s a simple fact: You can’t impress clients in today’s increasingly online-focused marketplace without a writer website prospects can visit. Without a writer website — it’s like you’re invisible. But it’s not as simple as throwing up any old site. Writer websites need to be designed and written right — for both your prospects and search engines — to attract the clients you want. The marketing tool that gets clients for you. Let’s face it, freelance marketing is hard and time-consuming. The answer? A strong writer website that brings quality leads to you instead of your having to pound the pavement — or apply to online ads where you compete with thousands of other responders. 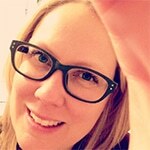 I know what you’re thinking — you’re a writer, not a website designer or a coder! And putting up a website can seem so boggling and complicated. That’s why we’ve designed this class to give you the basics you need and show you the shortcuts to getting a site that becomes a client magnet. Good news: Getting a great site doesn’t cost a fortune, either. Week one: Website and SEO basics — options for a quick & affordable site, choosing a URL, meta data, headline and tagline that gets you found by prospects. Blog-based site vs static site — we’ll cover all the basic setup questions. Week two: Design and usability essentials & common mistakes — Where your sidebar belongs, where to put your contacts — learn all the elements needed to create a powerful, effective site that impresses prospects. We’ll also highlight common design/usability mistakes and how to avoid them. Week three: Writing your website copy — Learn how to craft compelling Home and About pages. Discover the subpages you need — and don’t. See how to make useful, appealing portfolio pages that convince clients you are the writer they want. Week four: Student site reviews. Get useful feedback on your website and make it even better! 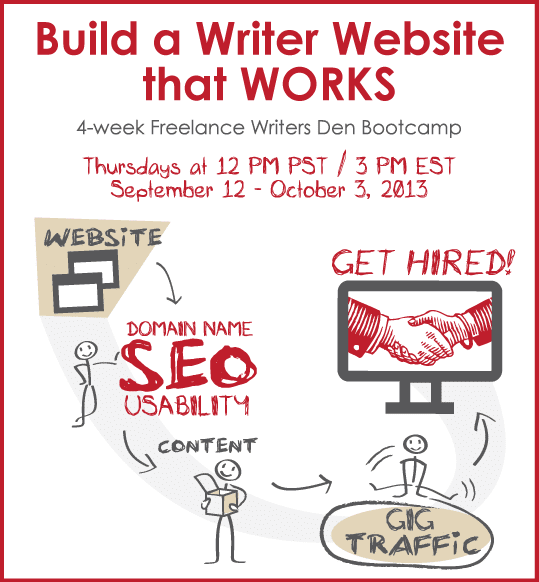 A 1-month membership in Freelance Writers Den is included! 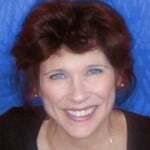 Hi there — I’m Carol Tice, founder of the Freelance Writers Den and author of the Make a Living Writing blog. My writer website, caroltice.com, ranks on the first page of Google for my target key word search. 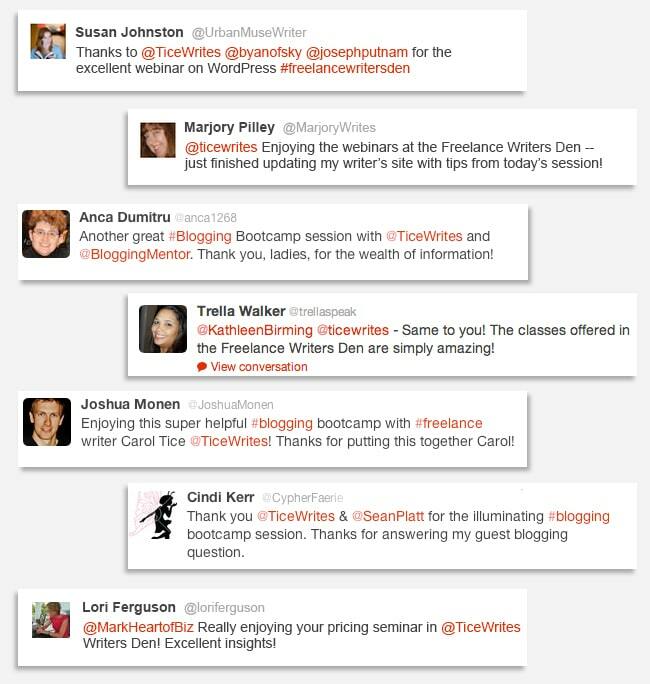 Since learning how to rank on search and about the design and usability tricks that make clients want to hire you, I’ve taught my methods to hundreds of writers, and I’ve reviewed more than 200 writer websites for Den members. As a freelance writer, I’ve written for Alaska Airlines Magazine, Seattle Magazine, Entrepreneur, Forbes, Freelance Switch, Costco, Lending Tree and many others. I’ve written two print books including The Pocket Small Business Owner’s Guide to Starting Your Business on a Shoestring (Allworth Press 2013), and self-published two ebooks, including 13 Ways to Get the Writing Done Faster (with Linda Formichelli). I’m Keira Dooley, owner of Design by Dooley, a design company that provides online design and traditional print design services. I started my business to make the web a more beautiful and usable place. My services include web design, social media marketing, email marketing, WordPress customization and much more. Prior to going solo, I worked at FIDM, Fashion Institute of Design and Merchandising, as an eLearning web developer where I led their student portfolio project. This project churned out hundreds of WordPress portfolios, displaying image and PDF document portfolios alike. I taught all of these students, most of whom had never even touched the backend of a website, how to create their portfolios within a matter of days to get gigs after graduation. As an faculty member, I also taught web design basics at California State University, Long Beach. Chris Marlow is an award-winning direct response copywriter — the first coach for copywriters since 2003. She has a membership site for copywriters and “Marlowites” — those who have completed her Marlow Marketing Method™ client acquisition course. Learn more by signing up for her mailing list. You could spend months or even a year figuring out how to get your website in shape…only to find it still isn’t bringing you the customers you want. Or take a shortcut — learn what you need to know to create a powerful online marketing tool that sells your writing for you, 24/7, and start getting found by better clients.